Compared to some other major metropolitan cities, Philadelphia may seem quite small, but we have an amazing cultural scene full of music, amazing food, and lots of visual stimuli. 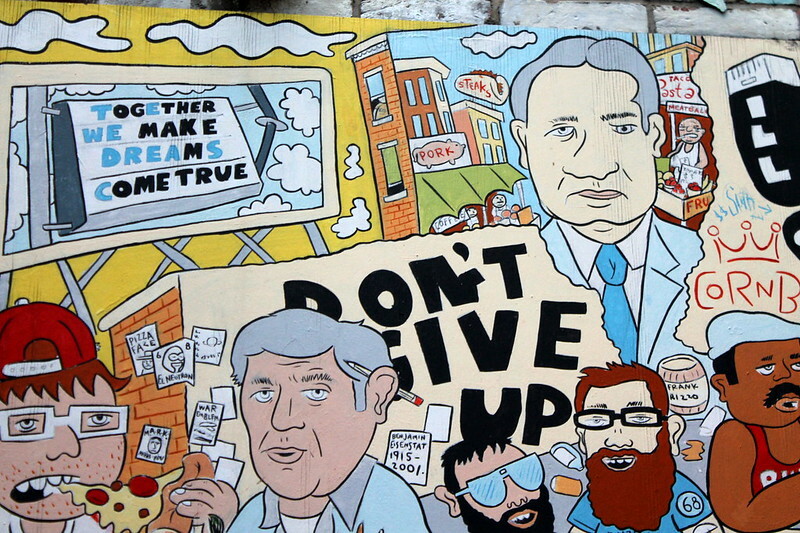 Since around the late 1960's, Philadelphia streets have been the home to some amazing street artists who color the city with their murals, mosaics, and their accompanying political ideologies. The first mural I really ever took notice to was Keith Haring's project at 22nd and Ellsworth in Point Breeze, not too far from my home. I was pretty young when it went up, but wise beyond my years and had already seen quite a few of his pieces on TV and in magazines. My mother never drove so we had to take the bus pretty much everywhere and in the early 1990's, the Mural Arts program had starting revolutionizing the way we saw street art in the city, especially, in my opinion, impacting lower income sections of the city with positive messages. I remember staring at the Dr. J. mural while riding the 61 Bus back from my Grandmom's house heading down Ridge Avenue and being overcome at the magnitude of the painting, trying to figure out exactly HOW someone could manage a canvas of that size. Then, as I started becoming more independent in my travels as a young teenage (riding my bike and rollerblading places my parents didn't even realize I was), I started seeing more and more of these giant canvases coming up as well as pieces rebellious youths were spray painting. And although fine art as far as drawing and painting on this level is the one things I could never seem to get good at, I still loved enjoying it both in its formal, and, especially it's informal settings. I spend a good bit of time before having Eamon riding my bike and photographing the city. In fact, I used to print free Zines and leave them in my favorite coffee shops and bard just because it was a fun thing to do. I was always drawn to nature photography but my early 20's saw a rebirth of my political self and I began seeing more and more depth in street art, especially things like wheatpastes, which, unlike spray painting, can be easily removed without damaging a facade. It's kind of like the more respectful form of graffiti. 2015 was not a huge year for me for my photography within the city limits, but I was able to sneak away at lunch sometimes and both search for and revisit some of my favorites. The truth is that I never usually know who the artist is exactly until way after I stop to glance and take a photo. 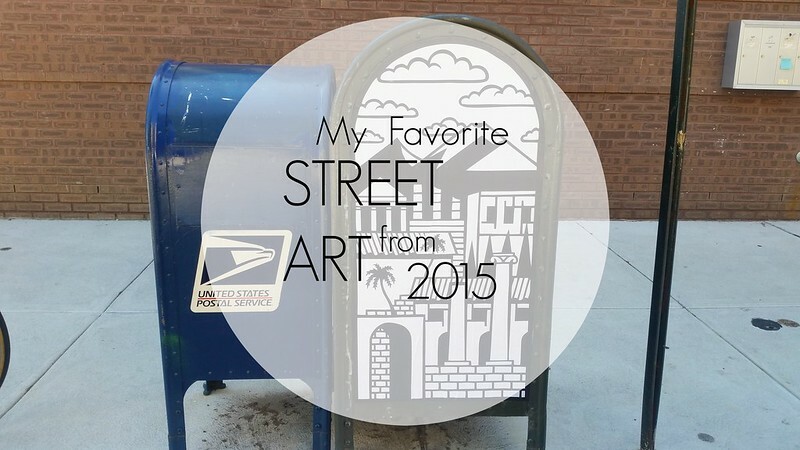 I usually rely on other local street art bloggers, such as Streets Dept and random Instagram posters, to give me info about the artist. 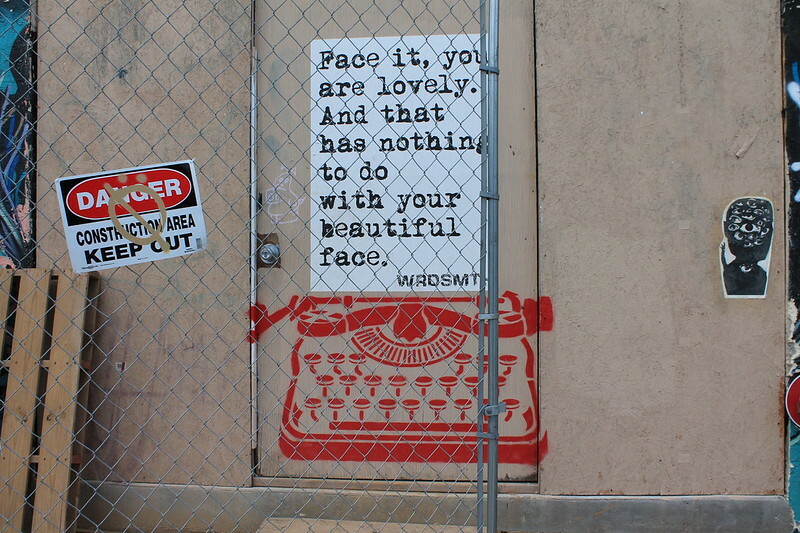 This install by WRDSMTH was probably one of my favorite pastes I found this year. Although he had many throughout the city, this is the only one I saw and remained near 5th & South for quite some time while developers were preparing to gentrify the little strip. 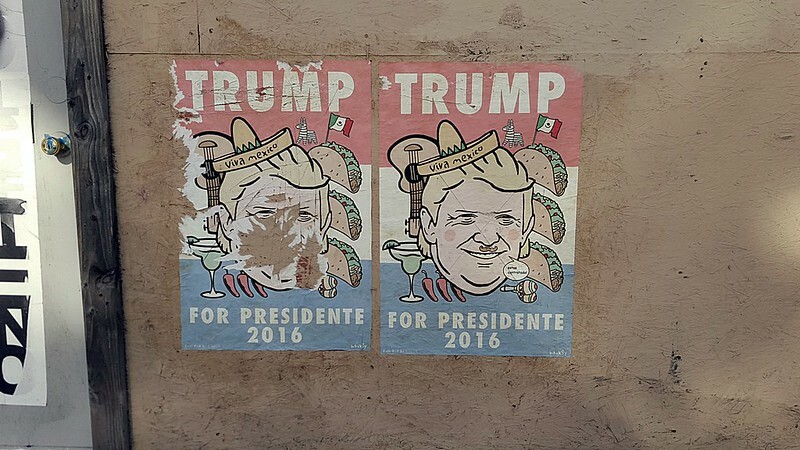 Donald Trump sure had his share of wheat pastes going on in the city this year highlighting his hypocrisy on outsourcing. This mural is literally right around the corner with me and for a while I simply though they were going to do some remodeling on the facade of the building and disregarded the platforms being set up. Instead, this beautiful piece by artist Eric Okdeh appeared. My neighborhood has been transformed into a haven for Asian immigrants fleeing places like Burma, Nepal and Vietnam, but I didn't really understand the significance until I searched for the info online. It highlights the endemic gambling found in the pockets of Asian immigrants and the lack of services available to them either out of pride, language barriers, or a little of both. If you click on the artist's link you can see a shot of the complete mural, which is incredibly vibrant for something with a terrible influence. 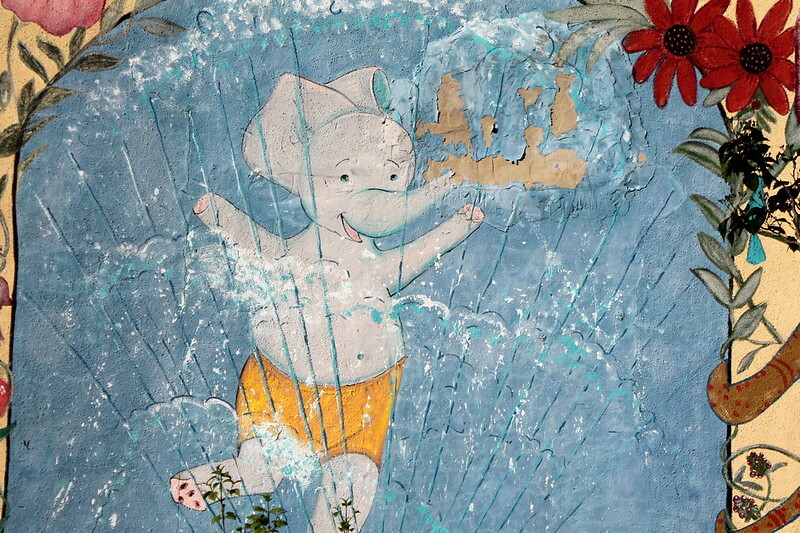 This obviously dated little elephant has been on the back wall near a school in Queen Village for as long as I can remember. The faded colors and daintiness of it reminds me of a children's book character but also makes me think about the carefree nature of children, which seems to be washed away so early any more. 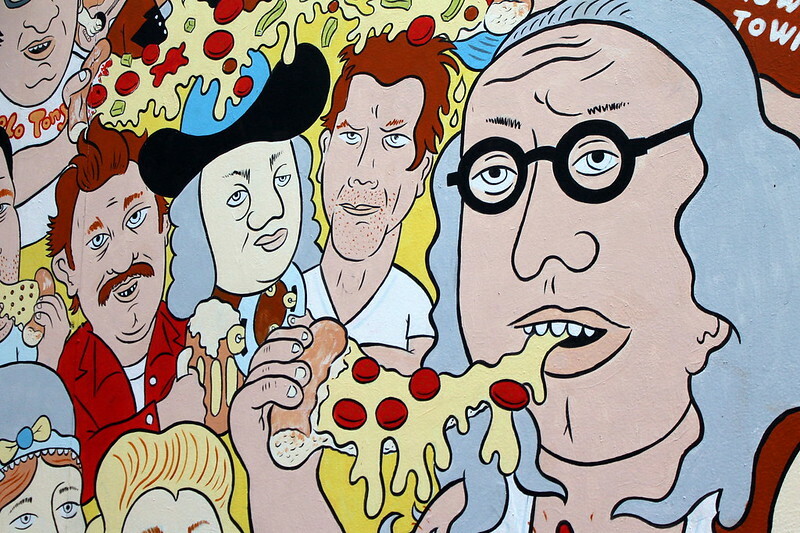 Although this isn't a newbie for me, the backyard mural at Pizza Brain -- probably my favorite non-traditional pizzeria and the world's only pizza museum that just so happens to be atached to a local ice creamery of a whole new fashion -- had never made its way to my portfolio until this year when we met with some old friends, drank lots of cream soda, and devoured some glutenous heaven while the boys ran around the yard. The mural is by artist Hawk Krall and displays lots of Philly-centric idols and scenes in an eye popping style of illustration that takes me back to the 90's (for some reason his style makes me think of the album cover on Green Day's Dookie mixed with something Green Jelly would have supplied on an insert). And last, but certainly not least, is this beautiful mural just below South Street on Bainbridge in Philadelphia. I have never been able to find the artist, but I did find that it was titled, "The Flowering Water Ballerina." There are so many ways to interpret the painting - women performing a balancing act? being restrained? - but it is pretty obvious that she is watering those flowers, right? Every time I pass it I stare a little deeper. However, there appeared to be some sort of addition to it this Christmastime as a picture of Santa Claus hanging upside down under a chimney found its way to the left. which kinda upset me, but to each her/her own, I guess...The painting is on the back end of a building and turns a cold concrete garage into something of beauty. 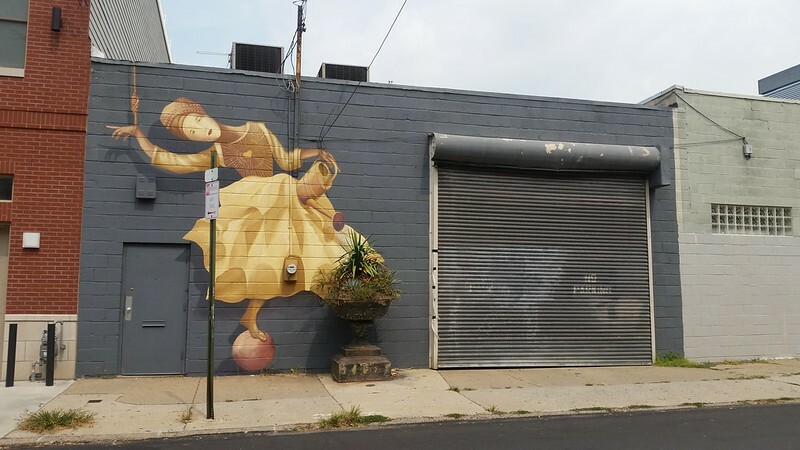 If you are ever up for a visit to Philly, I would suggest taking part of your day and visiting some of the murals and definitely keep an eye out for pieces from indie artists. 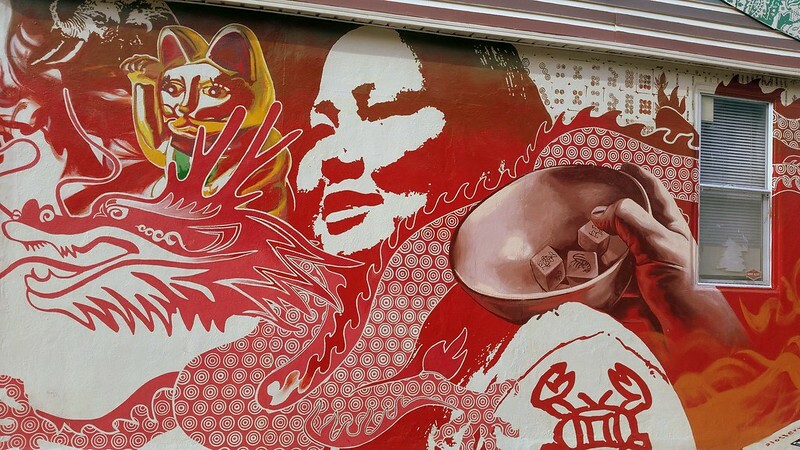 If you are more for guided tours, the Mural Arts Program conducts in depth tours of murals, in particular those in Center City that tourists are more prone to see, and there is a self-guided "Mural Mile" walk that starts right near City Hall and takes you through Center City at your own pace and leisure. They're a great way to see the changing neighborhoods and demographics in the city and help get a peek into what's in the heads of those artists sharing their gift.